This method is used extensively in Asia and in environments where filtered bags are either unavailable or too costly. Usually bags of 15 to 17 cm wide and about 30 cm long with gussets, are filled with wet substrate of mixed grain and saw dust. They are typically filled about ¾ high, autoclaved at 121°C for a certain length of time, and cooled. The mother culture is introduced from the top where a hole is prepared. After which a collar and cotton plug is installed and the bag is left to incubate. This done in a glove box. The advantage of using this bag is that it is inexpensive and PP bags with no filter are easily available. However, without some custom additives, bags are usually too brittle, and when standing up, the lower four corners may easily have holes. The collar is reusable, and new cotton is used every time. Polyethylene bags without filters are not used for spawn production. 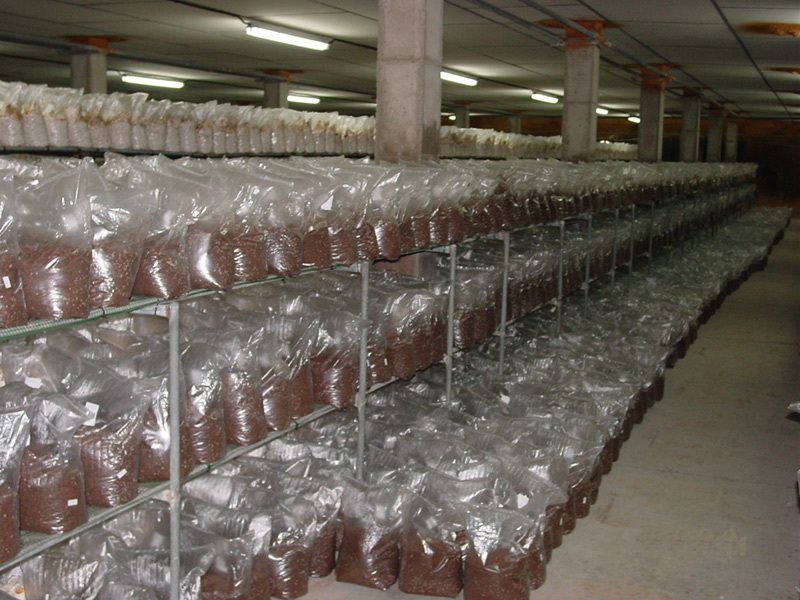 Breathable mushroom bags produced by Unicorn are widely used in mushroom and spawn production around the world. Breathable polypropylene bags with different filter types are widely used for spawn production. In farms where spawn is produced for farm use, a stand up bag is generally used. Small bags of 10 by 8 by 30 cm gusseted with a filter 10 cm down from top are common. Larger bags with a 20 by 12 cm foot print and 50 cm high are also commonly used. For Agaricus spawn, grain spawn, filters of the PP non woven with PP membrane are used. The filter are low gas transmission filters that retain CO2 . Unicorn type M filter and Celgard are examples of this filter. A preferred pore size is 0.2 micron. Shiitake and pleurotus and most specialty mushrooms prefer a higher gas exchange filter. Unicorn type OB, and Santomi Plabag uses a PP non woven filter, and Van Leer has a similar filter as Santomi. Pore size remain at 0.2 or lower, but the efficiency of the filter (larger number of pores per unit area) allow higher gas exchange. By using PP bags and filters, substrate is autoclaved in these bags, and because these bags are of higher cost and more spawn is produced per bag, a more reliable bag must be fabricated. With PP resin, different proprietary raw material mix is used to modify PP to reduce oxidation and add to the PP resin a modifier to make the final autoclaved bag retain impact strength, or more stretch. Thus modified, bags will less likely have holes, and sealing temperature is widened. It is also important to have a clear bag to observe any instance of contamination. Some bag fabricators use a special resin developed for hospital waste, this resin increases sealing temperature and reduce clarity, thus not a desirable bag for spawn production. By reducing oxidation, PP film retains its original properties and less hydro carbon gas is given off. Breathable PE bags with filters are much used in spawn production. Because these bags are not autoclavable, sterilization is by irradiation. It is noted here that if PP is irradiated, PP disintegrates. PE filtered bags are often used by large spawn producers in sizes of 35 by 60 cms. Large spawn producers often use bulk sterilization of grain spawn. This is done by sterilizing the grain in jacketed mixers which heat and cool in fast cycles and grain introduction into the already sterilized and cooled by proprietary methods and then mixed. The mixed, and spawned substrate is filled into the PE bags and sealed to incubate. Apart from fast cycles, the finished PE bags have a smooth surface unlike PP spawn bags are often dented by protrusion of grain during autoclaving. However, the bulk sterilizing is very expensive and difficult to maintain. Filters for these bags can be PE non-wovens like Tyvek, or other proprietary PE non wovens and membranes. PP filters can also be laminated to PE by introducing an intermediary non woven that heat sealable on PP and PE. Most PE bags with filters use a large panel of filter material but instead of a large hole cut in the bag below the filter, under the large panel sealed within the panel of filter is a series of small holes. The size of the holes are very critical to allow low evaporation of humidity, and yet give the spawn fast growth. If a large hole is cut under the filter. There usually is an area below the filter that humidity is low and no colonization results, and at times, this is a considerable amount of loss to the user. The large panel of filter distributes gas exchange over a large area, and is the guarantee for fast and uniform spawn colonization. Several manufacturers use laminated PP materials for the bag body, and one bag manufacturer has a zipper like gas exchange method. Laminated PP is a laminate of high-temperature, stiffer PP onto a lower-temperature, softer PP resin to utilize good properties of both types of resins. HDPE cannot withstand sterilization temperature, therefore substrate contained in HDPE bags are pasteurized at 95-100°C, for 8-12 hours. After cooling, holes are punched and spawn is deposited in the hole and wax is applied to seal the spawn in the hole. This method is laborious but is the least expensive, and many Asian countries prefer this method. As with spawn, bulk sterilized substrate may use PE bags with filter to incubate. Tyvek is generally preferred. Most users of PE bags in the US incubate about 22 days and strip the bag off for browning. Many European countries produce pleurotus mushrooms with substrate similar to that of Agaricus, and place about 25 kgs of substrate into a gusseted bag with pre punched holes. Bags formation and filling of spawned substrate are done by a machine. Black film of sufficient thickness on a roll is placed on the machine and holes are punched at the time the formed bag with substrate is being ejected. Typically bags are stacked. These breathable mushroom bags reveal the shiitake mushroom mycelium as it colonizes the sawdust substrate. Breathable polypropylene bags with filters are by far the most commonly used bags for mushroom cultivation. For shiitake, UNICORN M filter is preferred. Celgard as used on Sunbag UNICORN T filter, and OB filter are also used extensively. Depends on time of incubation, percentage and type of nutrient used, temperature of incubation, amount of spawn used and weight of substrate in bag, different growers may prefer different filters. Bags from Mycelia, with lined zipper like bags are also used for mushroom cultivation. This breathable Unicorn Bag is made of polypropylene with a Type T filter. 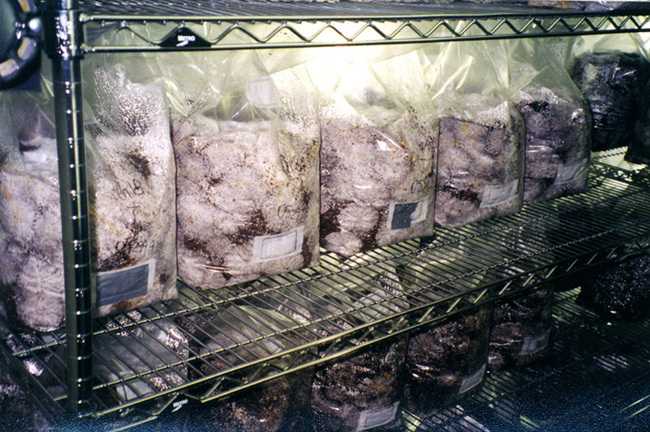 Type T filtered mushroom bags are 99% efficient for gas transfer and spawn production. A bag with a Type B filter looks about the same, but the larger pore size allows breathable mushroom bags with Type B filters to be sealed before autoclaving. In different farms, the basic preference is either “browning in bag” or “browning out side of bags” In the first preference, plastic bags are left on bags until a formation of “brown skin” of dead mycelium and substrate forms. Depending on strain and mycelium growing conditions, this usually take over 50 or more days. The bag is then stripped off the substrate. The skin serves to protect the substrate block from contamination, and allow the substrate within to ripen and when the conditions are right, blocks either are subjected to a cold shock, for fruiting. Filters on bags that brown in bags usually require a higher gas exchange rate. Larger number of racks are needed, as the total time from incubation to fruiting take longer time. Usually larger and firmer mushrooms are grown by this method. Nutrient in substrate is not usually above 35%. Some growers prefer browning outside of bags. After 17-20 days of incubation, heavily supplemented substrate (40-60%) are white on the outside, but still not completely colonized inside of the block, plastic bags are stripped from these blocks. The blocks are left on racks to brown or formation of the brown skin. Temperature in browning rooms are lower at about 65°F. When conditions are right, after 25 days or so, blocks are soaked to fruit. Growers use this method usually strife to fruit at the shortest time. Different strains are chosen for either of these methods. In some instances, growers use Unicorn bag type 14 and nutrient percentage can reach as high as 60%, and incubation days about 17 and curing 30 days. When incubation is short, such as 17 to 20 days, growers do not need to use bags with expensive filters, because by the time high amount of oxygen is needed, the plastic will be stripped off anyway. The incubation room is generally maintained at a constant 65-67°F. When fruiting is needed, a well water soaking will induce fruiting. Saw dust based substrate are autoclaved in PP bags with filters most bags are 10 or more inch wide in diameter and 2-4 feet long. Bags use a high gas exchange filter Like Unicorn NB type filter. Unicorn bags are designed and manufactured for applications requiring sterilization, by heat, gas, UV and gamma radiation methods and gas transmission under sterile conditions. These include mushroom cultivation, mushroom spawn production, incubation of fungal products in bio-control industries. Unicorn bags in pillow style are chosen by many mushroom spawn producers for fast and reliable production of quality spawn. Unicorn pillow style bags can be manufactured using any of a large number of filters our company manufactures. Unicorn bags can be supplied for filling by any machinery. This pillow style breathable bag has two large Tyvek filters. 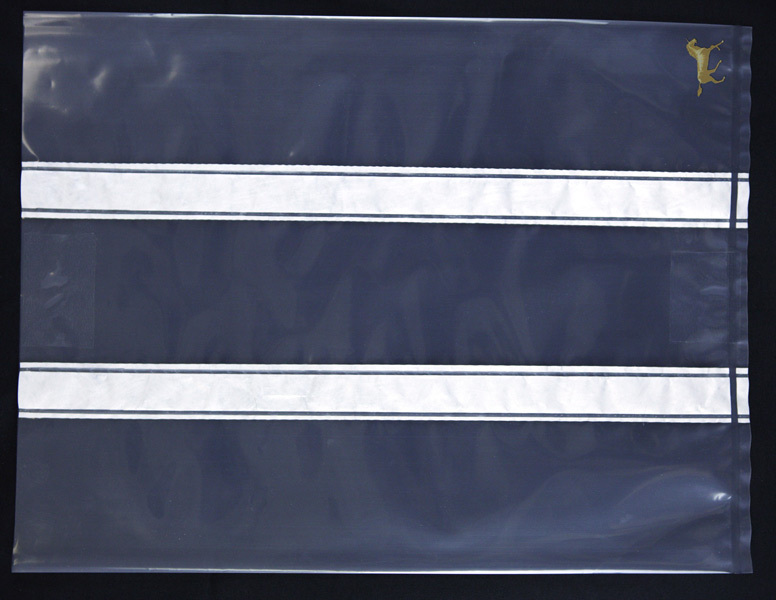 Unistrip and multistrip breathable bags are often used for commercial spawn production. The bag opens by hand or automatic bag opening devices and a funnel introduced weighed substrate into the bag. The bag is filled between 50 to 60? of its volume, the top of the bag is folded down, and the bag is sterilized. After cooling bags are opened, preferably in a ‘clean’, filtered air stream, and mother spawn is introduced to the bag. The bag is immediately sealed and agitated to mix the spawn with the substrate. Bags are now ready for incubation. We have nine different HEPA filter materials. The bag sizes below may be manufactured with different filters. Custom filter sizes, filter numbers, either ‘cut outs’ or pin hole types and their positions are available to suit your needs. Table above does not reflect tolerances. We reserve the right to change specifications without prior notice. Unicorn Bags produces a side-gusseted style that gives a sturdy stand-up bag after filling and a strong bottom seal. Manufactured with equipment we designed and with proprietary additives, Unicorn Bags are pliable at any temperature as well as after sterilization. The bag opening is designed for easy sealing and the bag’s bottom seal can withstand agitation. For help in identifying filter types, see our “Visual Identification of Filters” page.